7-1/2" x 6-1/2". Sleeping man w/angels and God in chariot overhead. Monochrome woodblock print bearing the number 73. Yo or Hiroshi Iwashita was born in 1917. Other than that one fact, almost nothing is known about him. The presence of his work at Berea College is thus of interest in showing this collection to have more than the usual, standard works by well-known masters. Similarly, in New prints (Shin hanga), Berea college has both standard work by the famous Toshi Yoshida (1911-1955) but also an usual print by Koho Shoda (1875?-1925? ), an Artist who style is intriguing in showing connections to Creative Prints but who is so unknown that not even his birth and death dates are clear. Iwashita's style is also intriguing. 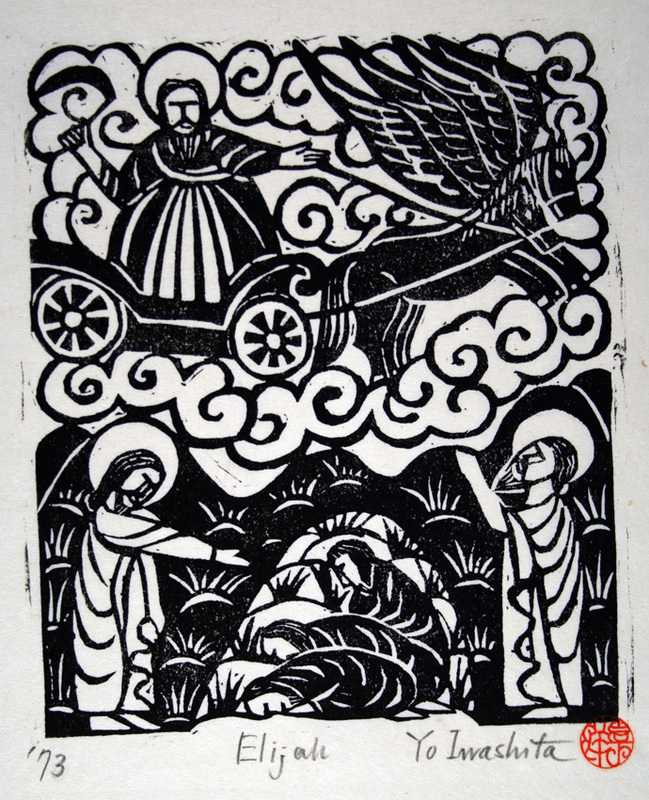 It resembles the rough manner of Munakata Shiko (b.1903), perhaps, the best known of the Creative Print masters. In this respect, Iwashita is a better representative of the Creative Print movement than Watanabe who used the unusual stencil-print technique. 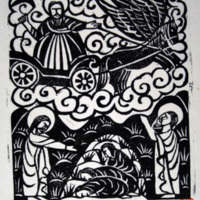 Yo Iwashita, “Elijah,” ASIANetwork IDEAS Project, accessed April 24, 2019, http://ideasproject.org/items/show/874.